SEE VIDEO ON VIRTUAL TOUR -- Custom inset cabinetry and millwork play an integral role in another timeless composition by Connell & Schmidt Builders. The best builders on the Hill deliver 3 floors above grade, with a rare balance of luxury and unassuming modern farmhouse style. Clean lines and a bulkhead free backdrop are made possible by the quality and thought put into a completely new structure and systems. 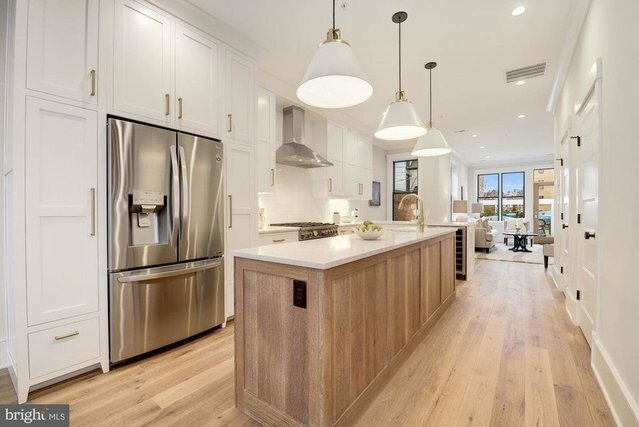 An open floor plan reveals a stunning kitchen with custom cabinets to the ceiling, perfect for urban living and entertaining. The work triangle is completed by a beautifully crafted white oak island topped with honed carrara marble + apron sink. The family room at the rear leads to a cedar fenced secure patio / parking with garage door while an extra living room on the 2nd floor creates flexibility. The owner~s suite has 12~ ceilings and provides a wonderful cityscape through Marvin windows framed by storage, book shelves and bench seating ~ a perfect nook. Dueling closets to the ceiling guide you to the marble clad owner~s bath which sports custom glass shower doors, a giant custom vanity, sconce lighting and a large soaker tub w/ skylight. A walk out roof deck with ironwood decking and steel railings provides extra outdoor space for entertaining. Come fall in love with this Victorian bayfront rowhouse which sits on the high ground of a one way street w/ a bike lane close to the best of H Street. Please check out @csbuilders on IG for a closer look.